Information about simple hygienic stool sample collection device. HyStool® – Stool sample collection device. HyStool® is a stool sample collector for the collection of stool (faecal) samples in medical tests such as the FIT based bowel cancer screening test, for crohn’s, colitis or any other test requiring the collection of a faecal stool sample. Our stool sample collection device is a Scottish invention made from pva. Unlike paper-based alternatives HyStool® is biodegradable, environmentally friendly, will dissolve completely within minutes, and is safe to flush away. This collection kit provides an easy to use simple and hygienic way to complete an unpleasant but necessary procedure. HyStool® bags are made from PVA – Polyvinyl Alcohol. PVA is a water-soluble synthetic polymer which has high tensile strength and flexibility. PVA is non toxic and biodegradeable. PVA is considered to be eco-friendly and it will dissolve quickly when it comes into contact with water. The final degradative products of PVA are carbon dioxide and water. PVA is used mainly for dissolvable packaging. It is heat sealable and convenient for packaging products in dissolvable bags. It is used for sanitary laundry bags used by hospitals to contain soiled clothing. The bags simply dissolve in the washing machine leaving no residue on the clothes. PVA can be found as the envelope containing laundry detergent “liqui tabs” and is widely used in freshwater sport fishing. Small bags made from PVA are filled with bait and thrown in the river where they dissolve near the hook to attract fish. 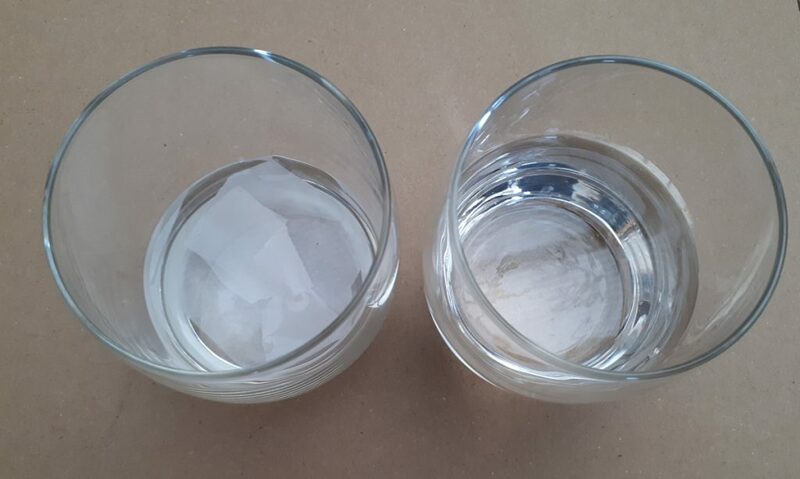 PVA can be made to dissolve in hot or cold water. Our HyStool® bags dissolve in cold water so that they can be safely flushed down a toilet. HyStool® bags will dissolve quickly without causing any blockages whilst being safe for the environment. Unlike many other flushaway products the HyStool® stool sample collector bags dissolve 100%. Why do we use PVA ? Look at the glasses. On the left we have taken a piece from a paper based stool collection device which states it is “flushable”. It has been in this glass of water for two weeks. On the right we have a piece from a HyStool bag which has been in this glass of water for thirty minutes. The Hystool bag has totally dissolved and the paper device has not. The Water Soluble Stickers that we use are made from repulpable paper. They are biodegradable and require no toxic chemicals to be removed, they are environmentally friendly too. 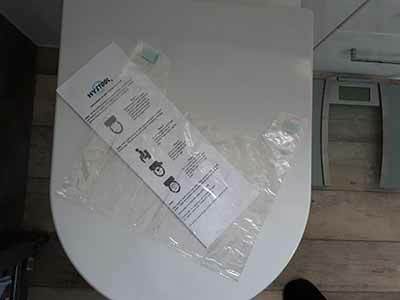 Like our HyStool® bags our stickers are safe to flush down a toilet after use. Four stickers come pre-attached to each bag. 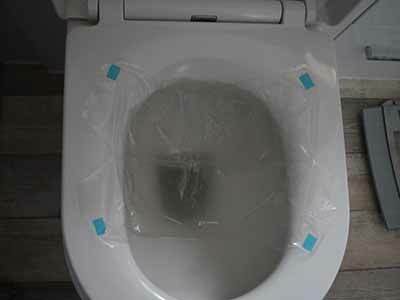 To apply the stickers simply peel off the backing paper and use them to stick the HyStool® bag to the toilet seat or toilet rim. In the unlikely event that they leave a sticky residue after removal simply wipe it away using a damp cloth. The standard HyStool® home stool sample collection kit comes with two bags, and instructions all contained in a resealable plastic bag. The resealable plastic bag containing our device measures 21cm x 13cm and weight of this kit is 21g. Each bag weighs approximately 10g. The two bag kit was designed with the Faecal Immonochemical Test (FIT) in mind. This bowel cancer screening test requires only one stool sample. 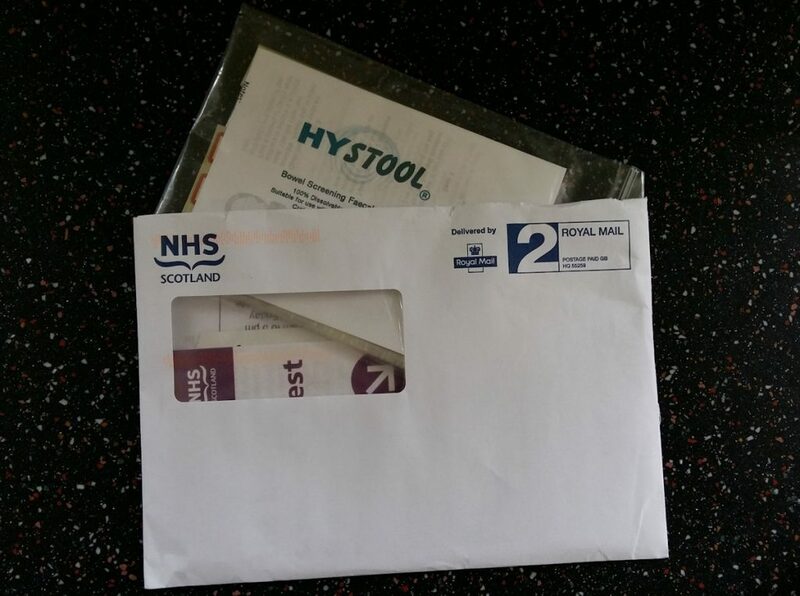 We have included two HyStool® bags in our home test kit in the unlikely event of there being a problem in using the first bag. We also have a four bag kit to accommodate areas / countries where the older 3 sample bowel cancer screening test is still in use. For clinics sending out testing kits then a single bag accompanied by written usage instructions will normally suffice. Please contact us should you require individual bags for this purpose. Reduced prices are available for larger orders. Larger packs suitable for hospital / clinic use are available on request. Please contact us for more information. The Faecal Immonochemical Test (FIT) is the new bowel cancer home testing kit first introduce in Scotland it is now being rolled out across Britain. Like the old bowel cancer screening test FIT looks for hidden blood in stool samples, which can be an early sign of bowel cancer. Deborah Alsina, Chief Executive of Bowel Cancer UK, said: “The Faecal Immunochemical Test has been proven to be more accurate and easier for people to complete than the current test”. Initial results in Scotland show a promising increase in the number of people doing the test although the percentage increase is difficult to gauge as the new test also came with better instructions. The Faecal Immonochemical Test does not come with any means of collecting a stool instead the recommendation is that you put layers of toilet paper into the bottom of a toilet (in the optimistic hope that the paper will stop the stool falling into the toilet water and not block the toilet), or use a container like an old ice cream tub which you place by hand inside the toilet bowl … and retrieve it again when finished. Neither of these solutions is ideal. Including HyStool® as part of any screening test kit would make stool collection much simpler and hygienic. If it were included then more people would do the test and this would lead to more detections and reduced healthcare costs. How should I collect a stool (faeces) sample? This is the question that many patients try to answer when required to provide a stool sample at their own home. The official guidance from the NHS (Great Britain) for this procedure gives the “helpful” advice of. 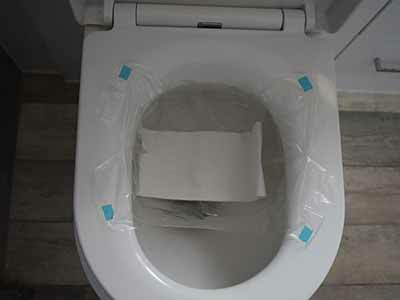 place something in the toilet to catch the stool, such as a potty or an empty plastic food container, or spread clean newspaper or plastic wrap over the rim of the toilet. 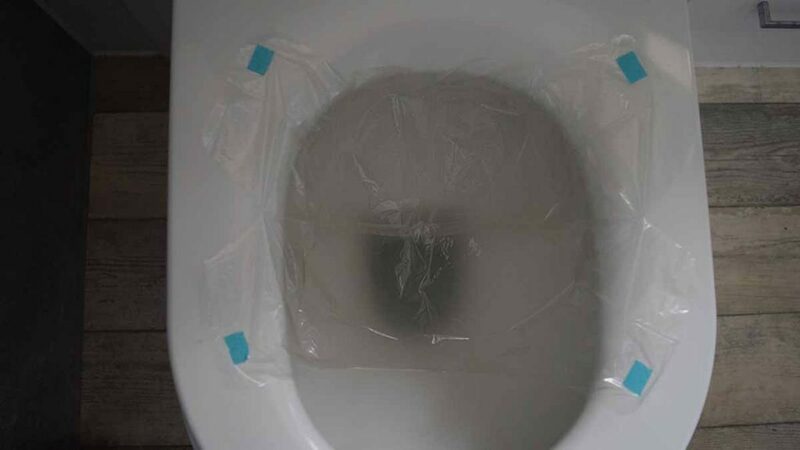 make sure the sample doesn’t touch the inside of the toilet. put anything you used to collect the sample in a plastic bag, tie it up and put it the bin. 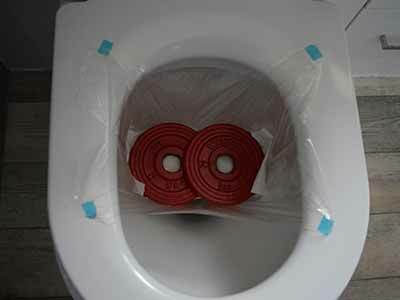 Or as an alternative we suggest you use the biodegradable, hygienic HyStool® stool collection device. No need to remove anything from the toilet .. or put in your bin. Simply flush it away. HyStool® easily fits inside the stool collection kit. HyStool® stool sample collector the simple and hygienic solution .. which is simply flushed away.